This is such a great story, and I just couldn’t wait to share it with you! 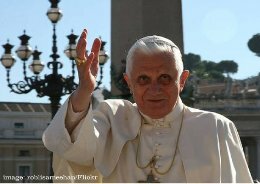 Pope Benedict XVI, straight from the Vatican, is encouraging priests to actively engage and share God’s word in online communities such as Twitter and Facebook. According to TechHerald.com, the Pope’s message was relayed recently from the Vatican, and in the message The Pope has actively encouraged Catholic priests to use the power of Web-based communities to help optimize their reach where religious communication is concerned. “The spread of multimedia communications and its rich ‘menu of options’ might make us think it sufficient simply to be present on the Web, or to see it only as a space to be filled,” said The Pope. “Priests are thus challenged to proclaim the Gospel by employing the latest generation of audiovisual resources (images, videos, animated features, blogs, and websites) which, alongside traditional means, can open up broad new vistas for dialogue, evangelisation and catechesis,” he added. Spreading God’s Word of hope has never been more possible, and more easily achieved than it is today. Literally from a mobile phone, Priests and Ministers can proclaim God’s Word to an audience of followers that are anxious to listen and to read. I’m excited to see how Twitter and Facebook will be applied in the ministry, and how the Internet will influence the spread of Christianity.